Fishers High School’s orchestras perform at last year’s Palladium debut as Todd McCready, FHS’s director of concert bands, conducts. (Submitted photo). 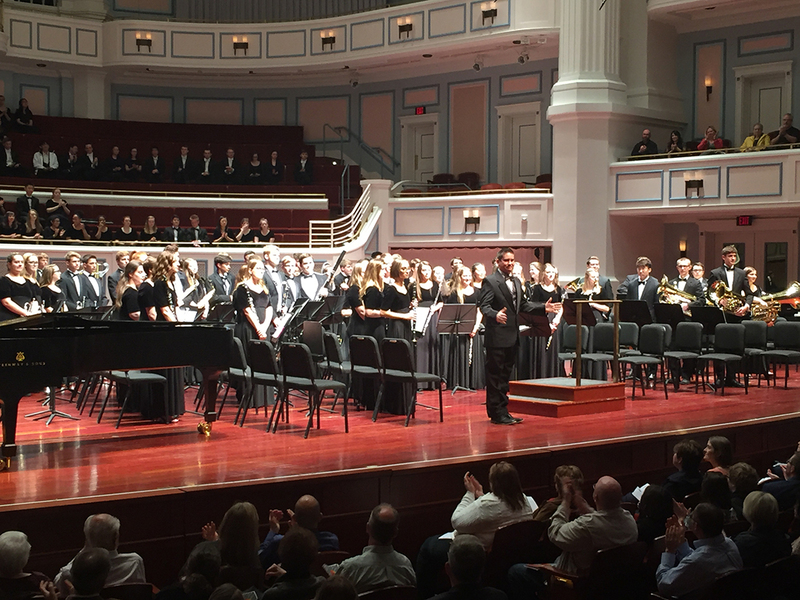 When a collection of Fishers High School orchestras and choirs performed at the Palladium last year for the very first time, Todd McCready called it a “world-class” experience. He expects this year’s ensembles to enjoy the same experience. “For many students, this will be the nicest performance venue in which they’ve been able to perform,” said McCready, director of concert bands for FHS. “Additionally, they get to hear excellent music performed by their most dedicated peers. Student musicians and singers will get their chance to shine on the Palladium stage April 22 during the Fishers High School Performing Arts Showcase Ensemble. Showtime is 7 p.m. at the Center for the Performing Arts in Carmel. The showcase will feature instrumental performances by the school’s Wind Symphony & Wind Ensemble and Symphony Orchestra, and singing performances by its Electrum and Sound choirs. Tickets are $15 and can be purchased online at thecenterpresents.org. McCready recommends anyone interested in attending to not delay their purchase. “So far, there seems to be high demand for this concert as evidenced by how well tickets are selling,” he said. “It is great for our students to be able to perform for a full audience, especially when they have such a good musical product. The bands and choirs, which prepare during regular class time, have spent most of the semester tuning up for this particular show.